Wouldn’t it be bizarre to explore how an artist would go about preparing their artwork for climate change? In a natural disaster scenario, no one says “Grab the passports and the dog… and the Modigliani!” So, the works presumably will have to fend for themselves. This thought launched my most recent series of work. 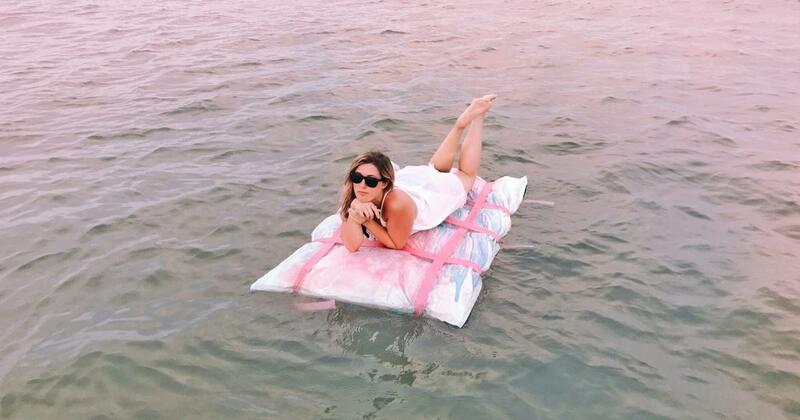 Now, a year and a half later, I will be floating down the Potomac River on top of one of my “climate change ready” paintings as both a demonstration of its capabilities and a symbolic gesture to the government establishments I feel are ignoring the problem. I’ve always believed that art and science strengthen each other when combined. In an era of half-truths, full-lies, and intentionally blurred lines, the relationship between art and science is more important than ever. Science provides us with the evidence, but I believe art can plant the message deep enough emotionally to sprout into useful action. What’s most alarming to me is that despite so many years of mounting research and warnings, we’ve done so little to solve the problem. There is a general sense of apathy when speaking to the general public about climate change. “Yes, it’s a problem, but what can I personally do about it?” they ask with a shrug. Photographs of starving polar bears and melting icecaps just aren’t jarring enough to a public exposed to far worse, albeit fictional, scenes on television and in movies. I hope to sneak through this wall of apathy that has currently built up around the issue, and I’ve found that my Trojan horse is a sense of humor. Humor catches people off guard, and I can often find myself in conversations with people who otherwise wouldn’t have been open to the topic. When I began researching various ways to make my paintings “climate change ready,” one place I looked was in the tomes of art history, and I found that creating paintings has always involved planning for their long term stability. Artists of the past learned how to layer their oils in such a way as to minimize future cracking. They created new pigments that were less volatile and held their original color far longer. Knives were hung beneath portraits so that should a home catch fire, the owner could quickly cut the painting from its heavy frame and toss it out the window to safety. With that history in mind, I decided to follow the long evolutionary lineage of pre-emptive art preservation, but today’s issues call for new solutions. I consulted with an expert in the field of art conservation, and through a process of trial and error, I began experimenting. I learned to weave my own canvas and embed buoys and other found flotation devices into the fabric of my paintings. I have tried approaches as simple and playful as wrapping existing paintings in common pool noodles to more serious and complex waterproof paintings made of synthetic sailcloth & marine foam. Kassewitz plans to float down the Potomac during the last week of August, weather permitting. For more information on her art and when and where Kassewitz will be floating next, you can visit her website: www.noelkassewitz.com or follow her on social media via Instagram @noelkassewitzart. Miami-born Noel Kassewitz is a Washington, D.C.-based artist whose paintings and sculptures explore metaphysical, gender, and environmental concerns. Her works have exhibited nationally in New York, Chicago, Philadelphia, and Miami, as well as internationally in Milan and Bologna, Italy.